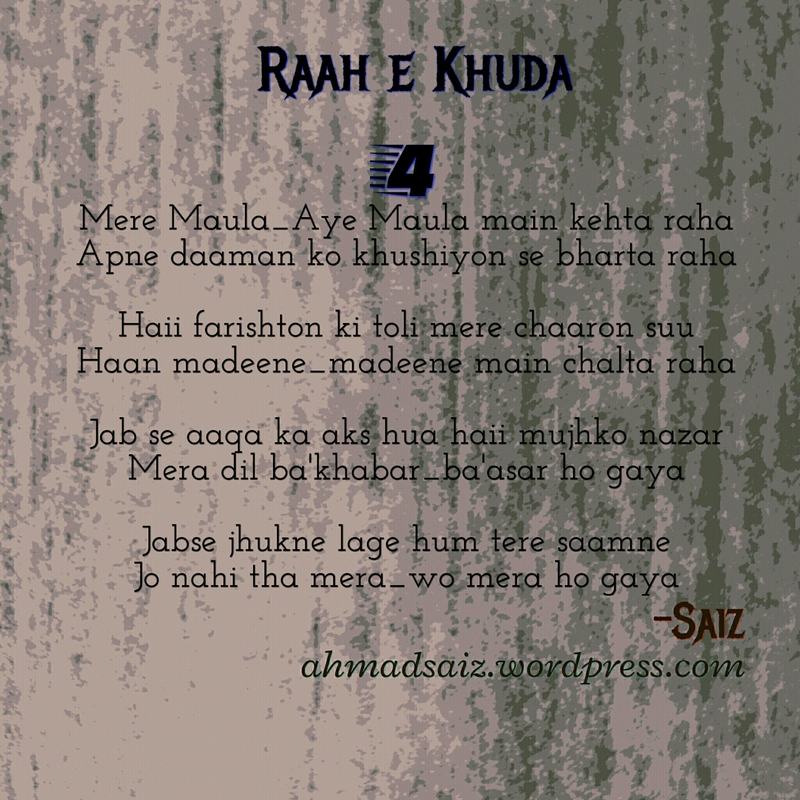 Raah e Khuda: #4. ~Mere Maula_Aye Maula…~ – I'm Here; Right Here. This one is really very close to my heart. I hope it turns out to be the best of the four. Simple crew of words to adorn my feelings in a simple Ghazal. Yeah, this is what’s gradually called – a Ghazal. Renowned and influenced turned my heart’s feelings. such devotion, such reverence is just mind-blowing. this is completely an obligation free feedback. truly truly very beautiful prose. This is a beauty laced comment. I smiled so wide that my shyness had me flying high. Yeah. It does seem like a bollywood song because most of those songs are written by Muslim lyricists. And they use kufr words which they know not if they did. Sad. I wrote it in devotion to Allah. I am glad it touched your soul. I think my job’s done. I understand your feeling. And trust me, I believe you. Thank you so much. Happy to have found a generous reader here. I too love the endeth verses. My context was to safeguard our modesty for the sake of our Creator; and not to impress the creations. To leave pride and materialism you first of all need to make sure there’s someone above you who’s much more powerful than you in all the aspects. I don’t agree with it. We need to be good for our own sake. We are all equal. That’s all. Jo nahi tha mera woh mera ho gaya!! Beautiful masha Allah. I love this line. I still wonder how simply I penned it down. If you sing it likewise. It would give you an endless joy I tell you.